Olivier Giroud insists lingering comparisons with Karim Benzema have not fuelled his impressive scoring run for France. Giroud’s brace in Sunday’s 5-2 Euro 2016 quarter-final victory over Iceland took him to 10 goals in his past nine starts for Les Bleus. Benzema’s international exile due to being under investigation for his part in an alleged plot to blackmail France team-mate Mathieu Valbuena left Arsenal's Giroud as Didier Deschamps' first-choice striker - a status that has not always rested easily with critics and fans alike. The 29-year-old was booed during a pre-Euro 2016 friendly against Cameroon, despite scoring in the match, while his team-mates and coach have regularly been forced to defend Giroud’s presence in the side throughout the tournament. Asked whether he welcomed there being no more talk of Benzema the morning after victory over Iceland, the former Montpellier player offered a measured response. "No, no - I admit I don't really think about that," he told a news conference at France's Clairefontaine training base. "I'm thinking about the team and the objectives of the game. Giroud maintained he would welcome a return for Real Madrid star Benzema after Euro 2016. "Perhaps he'll come back. I don't really have any problems with him," he said. "There are no problems and nothing for sure for me to say against him. I do not make it a personal case. "I'm having fun in this competition with the French team and trying to realise our objective. That's it." 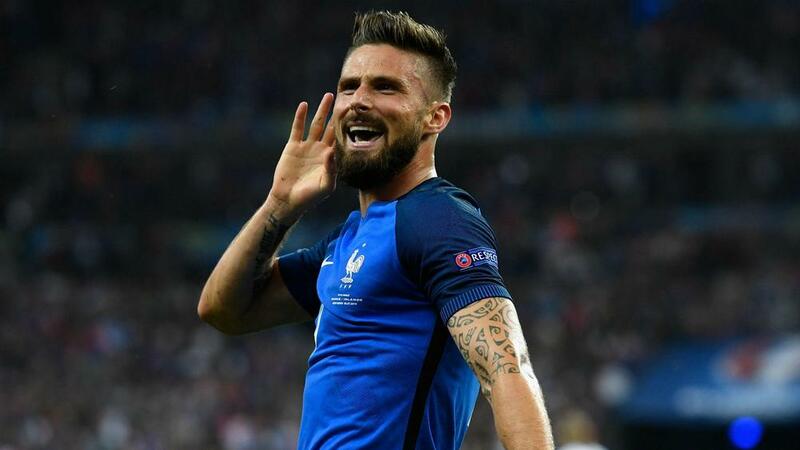 A huge factor in Giroud's enjoyment is his place at the spearhead of a dazzling French forward line alongside Antoine Griezmann and Dimitri Payet - the trio responsible for 10 of France's 11 goals en route to Thursday's Euro 2016 semi-final against world champions Germany. "It's an attacking formation. We've done additional work on crosses and with the midfield, which recovers the ball higher up the field. "There is team work to make sure us three can take advantage. "Of course there is a certain understanding, a chemistry, between us three. I can't see for the country how this doesn't work well if we continue in this way."